This Easy Peppermint Bark is simple to make, and it’s perfect for holiday gifts…if you don’t eat it all first! Hi, my name is David, and I hoard holiday candy. There. I said it. And acknowledgement is the first step to getting over something, right? For the longest time, I would go out the day after every major holiday and stock up on the leftover candy at half-price. I don’t mind eating red and green M&M’s in January or Easter-themed Reese cups in May. It’s still the same candy! I think stores began wising up to this trick a couple of years ago, though. Now it takes them a week or two to drop the candy to half-price. By that point, the only candy left is stuff like those weird pumpkins at Halloween or a 10-pound bag of conversation hearts. I’ve managed to overcome my holiday candy hoarding habits…unless it comes to peppermint bark. I can only find peppermint bark during the holidays, so I have to hoard a bit! I definitely remember buying 3 bags of peppermint bark squares at Williams Sonoma after the holidays a couple of years ago. I managed to eat two bags, and then that third bag just hung out for a long time…I think I found my peppermint bark limit that year! With the holiday season in full swing now, I noticed those bags of peppermint bark in the stores. I made a mental note to come back in a couple of weeks and pick up some on clearance. That’s when it hit me. “Wait a second. 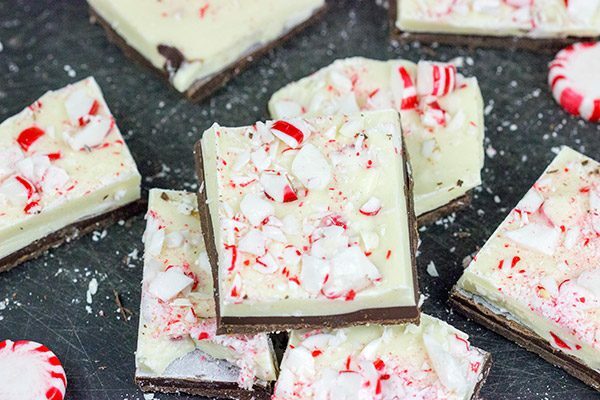 Peppermint bark would be really easy to make at home. 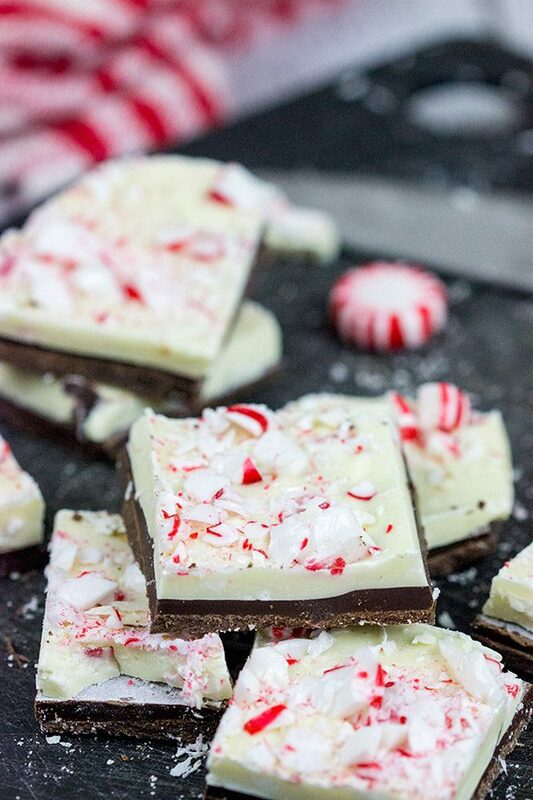 Chocolate + peppermints. Done!” So I came home that very afternoon and made a batch of this Easy Peppermint Bark. Delicious! Now I did take an extra step and made a semisweet chocolate + white chocolate layered version of this easy peppermint bark. In reality, that just meant melting 2 different kinds of chocolate, so it wasn’t too hard. But you could certainly just keep it at one type. 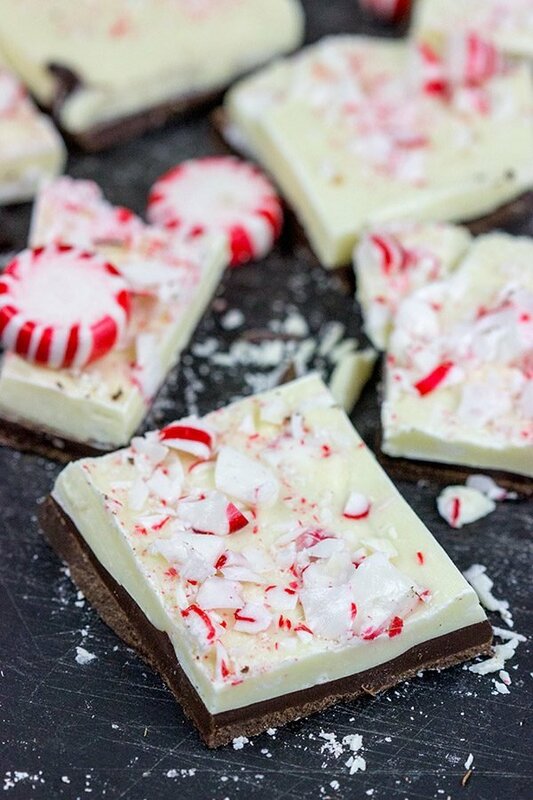 I love semisweet chocolate (heck, I love all chocolate), but I have to say that white chocolate is my favorite when it comes to making easy peppermint bark. The creaminess of the white chocolate contrasted with the crunch of the broken peppermints is just too good! 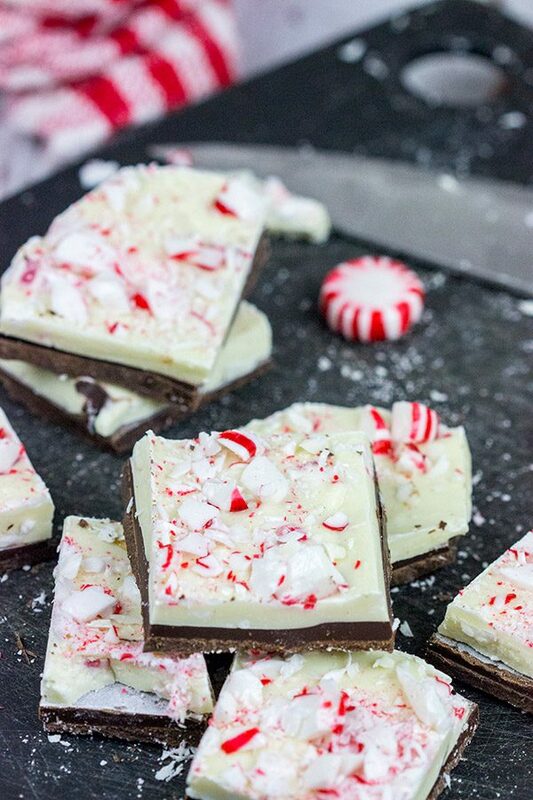 What type of chocolate do you use for Peppermint Bark? I personally used baking chocolate for the semisweet layer and then white chocolate chips for the white chocolate layer. Truthfully, you can pretty much use whatever chocolate you have around the house. 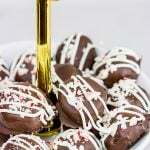 I also add just a tiny splash of peppermint extract to the melted chocolate. Peppermint extract is strong stuff, so don’t use more than just a tiny splash! And, of course, I crumble up peppermints to sprinkle into the white chocolate layer. Funny story about the peppermints: they ended up all over my kitchen. And I’m not talking the whole peppermints in wrappers. I’m talking broken pieces out of their wrappers. I was standing there trying to figure out how to crush peppermints, and I had the brilliant idea to put them in a sandwich bag and then just whack that bag on the countertop. Well, that worked. It broke the peppermints up. And it also broke the bag. I heard peppermint shards raining down all around me. Then I spent the next 10 minutes cleaning peppermint pieces up off of every flat surface within a 15-foot radius. So learn from my mistakes. Don’t wack a bag of peppermints against the countertop. I ended up putting the peppermints in a metal bowl with high sides and then using a metal drink muddler to break ’em all up. Much better! No matter how you break up your peppermints, I hope you enjoy this Easy Peppermint Bark! It’s a holiday favorite, and (if you’re like me) now you can have it all year round. If you make this recipe, swing back by and leave a comment. Or better yet, snap a photo and tag me on Instagram (@Spicedblog). Happy holidays, everyone! Looking for more fun holiday desserts? Check these ideas out, too! Line an 8”x8” baking pan with wax paper; set aside. Using a double-boiler or a heatproof bowl set over a gently simmering pot of water, add semisweet chocolate and 1 tsp of oil. Heat, stirring occasionally, until fully melted. Once melted, stir in ¼ tsp of peppermint extract. Pour melted chocolate into prepared baking pan, using an offset spatula to spread chocolate evenly across wax paper. Spread the white chocolate over the semisweet chocolate, using an offset spatula to spread evenly. Sprinkle the remaining crushed peppermints on top of white chocolate; press in gently. Refrigerate for 30 minutes, or until hardened. 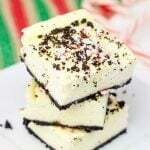 Remove peppermint bark from pan and cut into squares or break into pieces. Hahaha! I’ve been there with the broken bag of peppermints; I did the same thing a few years ago making Christmas cookies except I used a rolling pin to crush the candies. The bag tore on the bottom, which I didn’t realize until I picked the bag up and peppermint candy powder went EVERYWHERE. Your idea to use a big bowl is a great one–you know I’m going to make my own peppermint bark ASAP! Hi David! This looks so Christmasy (that’s a word right?)!! My son’s girlfriend loves peppermint bark so I’ll be making this to send to her. I like the double layer of chocolate as I find white chocolate a little bland, so the addition of the semi-sweet is a great idea! I can’t believe Thanksgiving is next week and before we know it Christmas will be here! Christmasy is totally a word, Dorothy! (Ok, my spellcheck on the computer tells me it’s not…but I disagree.) I’m with ya on the white chocolate vs. semi-sweet chocolate. I do like white chocolate, but I prefer a mix. That’s why this bark is perfect! Plus, it just looks cool, right? 🙂 Definitely keep this one in mind for Christmas gifts…after all, the big man in the red suit will be coming down the chimney soon! Oh, how fun! I pay big money for what I buy at Williams-Sonoma! I’ve shied away from making bark ever since I attempted a two layer variety and the chocolates separated. Candy making is not my thing. That’s the exact tin of peppermint bark I’m talking about, Mimi! I’m not gonna lie…Williams-Sonoma makes some darned good peppermint bark. But it’s also big money. I like to dabble in candy making, but I don’t do it all that often. The holidays are the best time for it! As far as those layers separating, I’ve had that happen, too. I fixed it by making sure the bottom layer was still melted when I added the top layer. Hope this helps!! Eh, I see your point, Ben. Sure, it might be a little strange to eat Christmas candy in February. But then again, who will know? I mean the candy is still candy…and it tastes delicious! Plus, there are certain candies (like peppermint bark) that you just can’t find year-round. And as bad as it was to clean up peppermint shards from all over my kitchen, I think your story is still worse. An exploding jar of dulce de leche sounds awful. Not only do you have to clean it from the ceiling (! ), but you didn’t even get to eat it! I’m so glad you took that first step! You know what the second step to any addiction is? Giving it all away! Just pack up that peppermint bark and send it my direction. I’ll hold it for you until….well maybe I’ll just eat it all! 🙂 This looks delicious – and addicting! Hah! As I was reading your comment, I was thinking “But, Kathy. I don’t want to give all my peppermint bark away.” Then I realized your game! Sneaky, sneaky, my friend. 🙂 Thank you so much! The holiday season is my favourite time of the year and I think it might have a lot to do with little treats like that. I love peppermint bark – I might have to double the recipe if I want to use it as holiday gifts as I’d be very tempted to eat it all first 🙂 Have a wonderful weekend ahead, David! You’re absolutely right, Miriam! And as much as I joke about hoarding Christmas candy to eat later in the year, there’s something to be said for just enjoying it during the holidays. That’s part of the magic of the season! We only get to enjoy things once a year, so we look forward to ’em even more. Either way, this bark is super tasty…and it’s perfect for Christmas gifts! Hope you have a great weekend ahead, too, my friend. Cheers! I am starting my Christmas baking real soon . This year is going to be special because my niece is coming. Candy making is something that I like to learn more about it. Your bark looks great, it’s so pretty. Oh man, that’s a bummer to hear about the mint chip ice cream. I’ve never made that flavor, but it’s been floating around in the back of my mind for a while now. Oh well. 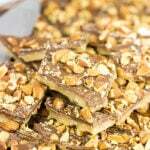 You should totally make this bark with the family for the holidays. It’s an easy recipe, and it’s fun to whack a few peppermints! 🙂 Thanks, Sherri! So you’re the one hoarding all the holiday candy! 😉 This peppermint bark looks amazing, David! I’ve bookmarked it to make for my best friend Mary – she is a peppermint fiend!! Peppermint Bark, yummy! 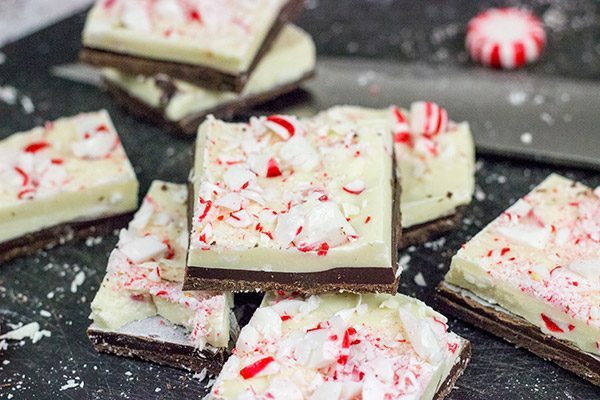 You have me thinking about Williams-Sonoma’s Peppermint Bark. But yours look just as good, easy to make and a heck of lot cheaper. Peppermint on the pavement, I did the same thing using a rolling pin. All went well, until the plastic bag broke. Chloe dog like it though, her breath has never been fresher than then. Love that you admit your candy “problem.” 🙂 This bark looks great –especially with the semisweet chocolate bottom layer. Hey, I didn’t think hoarding holiday candy was really a problem until Laura pointed out that it’s kinda strange. Oh well. Now I just make my own instead. 🙂 This homemade version of chocolate bark really is quite tasty! Thanks so much, Valentina! I’ve had that WS I peppermint bark, too. It is good. I know how you feel about the candy crushing problems. For most thing like that, a resealable plastic bag and a rolling pin work, but peppermint candies are hard little buggers, and the shards cut through the plastic. I’ve resorted to a clean, flat kitchen towel (not the fuzzy kind, but the tight-knit kind – the kind, in fact, that they sell at WS) and a hammer. That WS peppermint bark is delicious indeed. I used to hoard the stuff, but then I figured out how to make it at home…and man is it easy! Well, minus the whole exploding peppermint and all. 🙂 The kitchen towel is an excellent idea. I think I might have something like that in my drawer. If not, it’ll be off to WS for a towel…and probably a bag of peppermint bark. Haha. Thanks, Jeff! I’m so glad you’ve gotten over your hoarding candy obsession – I know I could never have done it – no matter what my intentions were on trying to “Save” candy for another day, said candy would always disappear! Speaking of disappearing candy…I’m willing to bet I could make this bark disappear off your counter in 20 seconds – yup ALL of it! Hah! I can always tell myself that I’m just ‘saving’ the candy for another day, but in reality I’m just hoarding it. Let’s be honest. 🙂 But now that I have this easy recipe for bark, there’s no more need to hoard it…well, at least not as much as before. Haha! Thanks, Shashi! I cannot get enough peppermint goodies this time of the year, so I hear ya! I love making homemade bark. And I’ve done the same thing with breaking the peppermint up in a bag, and then breaking the bag haha I think I use a meat tenderizer to do it usually, but I may have to try your new method out. Hmmm…a meat tenderizer is a great idea for peppermint breaking, Nicole! I had to resort to the bowl after I managed to send peppermint dust everywhere. It was seriously raining peppermint in my kitchen, and I was standing there like: “Really? Really?” 🙂 Thanks so much, my friend! Delicious! I once made peppermint for Christmas and it went down OK with the coffee after our Christmas Dinner, but I like your peppermint bark a lot more. At least your kitchen (and yourself 🙂 ) will have smelt good with all those bits of peppermints about! Ha ha! Wow, this sounds so good! I’m diabetic and buy sugar-free peppermint and wintergreen candies. I’d use lower sugar chocolate chips but regular white chocolate chip. That way it has some real sugar but won’t be too sweet. For storage, are plastic zipper bags or a metal cookie better? I’ll refrigerate, 9f course. I’m thinking of throwing in chopped walnuts to one chocolate layer. Make it healthy! And your idea of chopped walnuts is a great one! I love chopped nuts in chocolate. 🙂 I hope you enjoy this recipe as much as we do! Your picture of the bark appears to have TWO chocolate layers? ?